We have been a busy guild. Thanksgiving is a couple of days away and I know many are busy with preparation. We had a flurry of activity at the beginning of the month. First we had our Winter Wonders Holiday Glass Show . Tremendous thanks to Joy, Pam, and all the volunteers for another successful show. It is a great deal of work and contributes largely to the activities we are able to do for the rest of the year, I am finishing the accounting and will have the details out shortly. The SYNERGY competition with GLBG came soon after amidst the classes and other activities. Thanks to Cindi Brunell (chair SMGBG) , Helena Hatten (chair GLBG), Annie Shook (magnificent ribbons) , and all the artists that participated. The competition was fierce and lovely pieces were submitted. I think the details will be in the upcoming newsletter. Our next meeting details are in the calendar and we can reflect then on what a great year this has been. Many thanks to all the volunteers that keep this group going. Keep the glass flowing and our glassy friendships growing. September is well upon us and I think we are all settling into the fall routine..
We had a great September meeting that included a delicious potluck and demos by our old friend and Master Glass Artist Lisa St. Martin , and our new friend, glass artist Rashan Jones. It was a fun evening filled with friends and glass discussions. It was great! Next meeting is in a couple of weeks on October 7th and I have put the information on the calendar. Bead Bonanza is October 9th and we want to encourage everyone to participate and help man the booth. This is a great show to advertise Winter Wonders and we look forward to seeing you there. Call to entry information can be found on the Shows page. Don't forget to register for the Terri Caspary Schmidt classes that will be held right after Winter Wonders in tandem with the Synergy project. Information can be found on the classes page. Class is limited to 10 students so sign up now. Terri is an amazing artist and we are thrilled she is coming to teach SMGBG! The summer has flown by like silver leaf near a fan! I don't know about you but I could use some lazy slow days to catch my breath. Recently I did a presentation for the Great Lakes Bead Makers guild that was well received. Doing our part in educating other artists about our glassy world. We had a trunk show as well and it was wonderful seeing all the bead makers viewing and purchasing our work. I have updated the info in the calendar for the next meeting in September. Happy summer glass Peeps! Haven't posted much this year so I thought I would get everyone up to speed about things. After having a fun meeting in May making garden stakes and a nice meeting in June having high tea, we are taking a break in July to enjoy the summer weather. July still has many opportunities for glass including the 2016 Gathering of the ISGB in New Orleans and The Michigan Glass Project at the Russell Industrial Center in Detroit. Both are the weekend of July 24th so pick your pleasure. Many of our glass brothers and sisters are also on the art fair trail this summer so look for them at the Wyandotte Art Fair and the Ann Arbor art fair. Many others cities have fairs so if you are participating make sure that your info gets into our newletter. Our next meeting will be our Picnic on August 7th. We will have our garage sale and general socializing at Cyndy's. Big discussion going on with the ISGB. 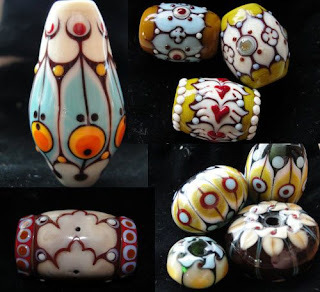 There is a proposal to change the name and everyone is talking about the state of art glass beads and how to sustain this art group. Let's talk about this more when we meet in August. How do we preserve our art while being welcoming to new artists? What can we do as a guild to help? Take a Leap and Attend the Synergy Collaboration kickoff reception! This is another excellent opportunity to stretch our skills and work with other jewelry artists. Can't wait to see what our collective creative minds create. If you have not joined but are interested please call Susan Richards 248-225-7680 for details. Tomorrow is our February meeting for Glassact members at Aubree's Pizzeria in Northville MI at 1:00pm. Details in the calendar. We will have a general meeting followed by a show and tell and a surprise creative project! Challenge glass will also be available to attendees. We have a great meeting! A new year full of new possibilities! Happy New Year Glass Peeps! Winter Wonders Glass Show Holiday Sale! Don't Miss!!! Below is a link to the Bead and Button call for entry. The last day for drop off of beads is Monday, June 1st. You can either contact Cindi Brunell or me regarding drop off. - a couple of beads marked "free" for us to hide among your regularly priced beads. You can also send a couple of pieces of jewelry that are example of things that can be done with your beads. It does help sell your beads. I would suggest bright colors for your samples and be sure they are priced. Glassact will be front and center at their usual spot tomorrow at Bead Bonanza, held at the Southfield Civic Center, from 10-5. Stop by, enjoy the gorgeous handmade beads and take a few home! This is a blog-based website which, we hope, will better fit the needs of the guild. There is a pro/con list below in a previous posting. Please feel free to comment and let us know what you think. There are still a few kinks to work out and Candy is going to do some visual tweaking to the site. So it's not 100% finished but getting close. One thing that we need from everyone are photos from our members for the gallery. Currently the gallery just has photos that I had from submissions from Winter Wonders that I used to test the gallery. Send me your most current photos or those of your greatest work and I'll throw them up on our gallery. If you find anything that is not SELF explanatory, please send an email to me at worksofjoy@gmail.com.